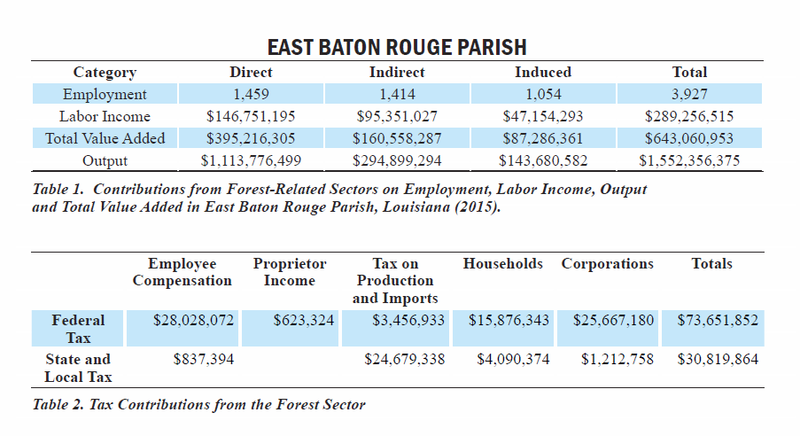 The forestry and forest products industry in East Baton Rouge Parish, Louisiana, had a total economic contribution amounting to approximately 3,927 jobs and $289,256,515 in income during 2015. Forestry and the forest products industry generated an output of $1,552,356,375 in this parish. Total industry output is defined as the value of all goods and services produced in the parish. Value added amounted to approximately $643,060,953. Value added represents the creation of new wealth and is inserted into the economy through payments made to workers, interest, profits, and indirect business taxes. These results were obtained using Impact Analysis for Planning (IMPLAN), an inputoutput model. Input-output analysis can track how the inputs of one sector of the economy are the outputs of other sectors. This can illustrate a sector or group of sectors’ importance to the overall economy.